Our cherry tree upped and suddenly died a month ago. The poor thing had not been well for a couple of years–it was attacked by an interior blight, leaving an open wound. 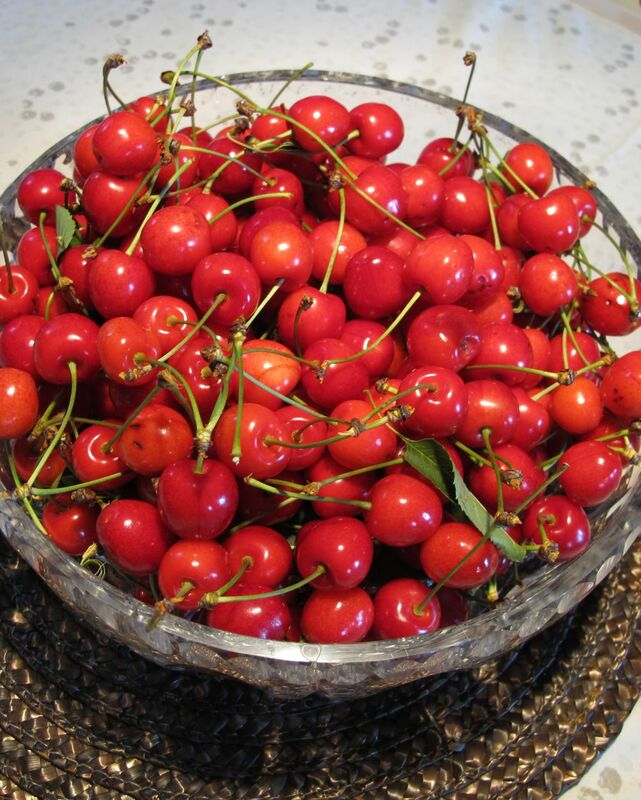 It still came up with the goods, yielding a good harvest of ruby red cherries each year. There were always more than we could deal with, though the birds helped out–there’s a limit to how many clafoutis* you can eat! Remarkably it flowered this year in the early spring and we were hopeful for another year. It was not to be. This morning our neighbour Lyn arrived with a large bag of cherries from their tree. Sorry to hear about this death in your “family.” As far as how to eat cherries, Lucy and I have found that good cherries eaten raw are delicious! Just pop ’em in your mouth and chew. Cheers. Steven–you are right–I forgot about the tree to mouth method!! I just had a bowl of cherries tonight for dessert! Although they were darker in color than the ones in your photo. Your mention of clafoutis brought memories. Years ago, I was visiting with a dear friend and her family. They lived in Clermont-Ferrand at the time. We took a stroll one day, and along the way, we passed a plum tree – mirabelles – in an alleyway behind their apartment. The tree had branches spilling over the garden wall, and we helped ourselves to some of the ripe fruit. (Did we steal it? Maybe.) She made a clafoutis, a dessert that was entirely new to me. I have made it (and with cherries) since, though not in quite a while. I love cherries all by themselves. I have added them to green salads. Hi Vicky–That is a beautiful route –St .Pons–Bedarieux anytime but especially at cherry time. The cherries we were given weren’t that sweet–so tonight I tried them in a flan. I didn’t stone them. It’s simple to make: Mix 3 egg yolks plus 3 eggs with 3 ounces of fine sugar and a teaspoon of vanilla. Add a scant pint of milk. Pull the stems off the washed cherries, and place them in a buttered baking dish, pour the egg & sugar mixture over it, sprinkle liberally with cinnamon and bake for about 30 min at about 350 degrees/170 C. Serve warm. Robin didn’t eat it (no good for diabetics!) but for cherries which weren’t sweet enough to eat by themselves, it is one solution. Life isn’t ALWAYS a bowl of cherries…. Everyone said it was delicious! Maybe someone has a better recipe for cherries that aren’t quite sweet enough…. Try some honey with the cherries. By the way hows the pussycat, any better ?? many regards (Chantal from Antwerp-Belgium). Butterscotch is profitting we think from a deal of good thoughts coming to her and is eating more. She is still frail but we live in hope! Thanks Robin, that’s nice news!Give from me a good hugh to Butterscotch. kindly regards and enjoy the evening,from Chantal & puskepuske (my cat).